I am delighted to announce that after two of the most extraordinary Audition Sessions I have ever witnessed where the talent on show was absolutley superb and after much deliberation, we have a wonderful cast for my WAOS production of LITTLE SHOP OF HORRORS. 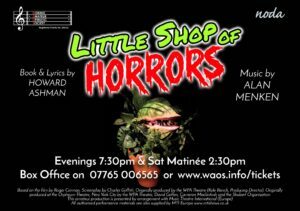 My production of LITTLE SHOP OF HORRORS with the wonderful WAOS has started and I’m very excited and encouraged by the enthusiastic response so far. With Brian Steel as the Musical Director and Zoe Davis as the choreographer, it will be lots of fun and frolics.